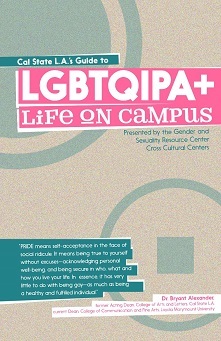 The Gender & Sexuality Resource Center at Cal State LA is dedicated to creating safe and respectful learning spaces, catering specifically to the empowerment of Womyn, Men, and the Lesbian, Gay, Bisexual, Transgender, and Questioning/Queer (LGBTQ) community. We pride ourselves in challenging societal norms that have been used historically to oppress and marginalize, while raising awareness on contemporary issues we face. The GSRC is open and available to all. Please visit us... Our doors are always open! The term "Womyn" has been adopted to reclaim a feminist identity that rejects patriarchal and sexist language. Dialogue Groups for Womyn and Men. The Queer Connection" student organization meetings. Books on Gender, Sexuality, Feminist Expression, Parenting, Identity, and Empowerment. 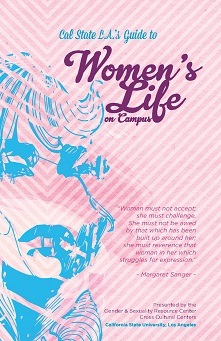 Programs and events that build awareness on issues concerning Womyn, Men, and the LGBTQ community. Individual Counseling and Crisis Intervention leading to on and off-campus referrals.